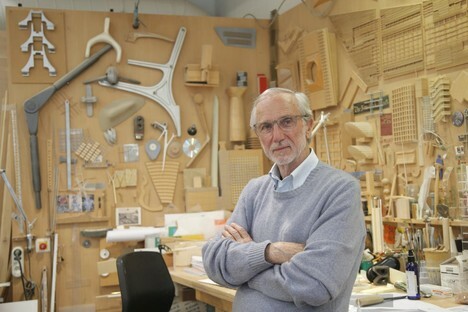 The Royal Academy of Arts autumn season will open on 15th September with a large retrospective dedicated to Renzo Piano. It is the first time in 30 years that London has hosted a complete exhibition dedicated to the work and career of the famous Italian architect and honorary member of the British institution. The exhibition will be held in the new Gabrielle Jungels-Winkler Galleries in Burlington Gardens, as part of the 250th anniversary of the Royal Academy of Arts. The title of the exhibition “Renzo Piano: The Art of Making Buildings” leaves no doubt, the whole intent of the curators is to offer a complete overview of the architect’s modus operandi, as well as the aspirations and achievements of a man who believes in the possibility of architecture, not only as a form of art, but as a complex profession that involves social, environmental, political and economic responsibility. Renzo Piano himself has said that “This exhibition aims to show how making buildings is a civic gesture and social responsibility. I believe passionately that architecture is about making a place for people to come together and share values.". Renzo Piano and his studio have created over 100 designs for important cultural and institutional buildings, from homes and offices in various parts of the world to urban planning for whole city districts. TheRenzo Piano Building Workshop (RPBW) founded by the Genoese architects in 1981, with headquarters in Paris, Genoa and New York, today has a team of 150 architects and other professionals. The filter through which Renzo Piano’s working methods are viewed and described are obviously his designs. Sixteen of his most important projects have been selected to provide a broad overview. The starting point at the beginning of his career has to be the Pompidou Centre in Paris.Designed in 1971 together with architect Richard Rogers and completed in 1977, the Pompidou Centre celebrated forty years of activity on 31st January 2017. It is an icon of modern architecture and undoubtedly marked an epoch-making change in the history of architecture. Other works displayed in the Royal Academy of Arts exhibition include: the Jean-Marie Tjibaou Cultural Center, Noumea (1998), the New York Times Building (2007), the skyscraperThe Shard, London (2012), the Jérôme Seydoux Pathé Foundation, Paris (2014) and among the most recent the Whitney Museum of American Art, New York (2015). The projects are presented with a wide selection of material from the RPBW archive: models, photographs and designs that focus on the design process of Renzo Piano’s most famous buildings. For example, studio models are an essential part of the design and construction process. For the New York Times building in 2007 the white ceramic rods were created on a 1:1 scale to test their features as a brise soleil, and the model of the Menil Collection in Houston (1986) is an example of the research and study carried out by the architects to bring natural light inside the building. 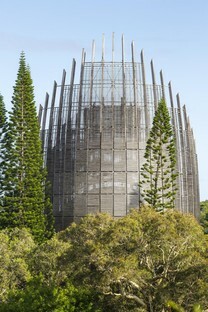 Materials on display also include original designs like those created for the competition for theCentro Culturale Jean-Marie Tjibaou in Noumea. The fulcrum of the exhibition is the architect himself: the curators have decided to focus on Renzo Piano’s sensitivity and attitude to architecture through 32 photos by Italian photographer Gianni Berengo Gardin and a specially created film by Thomas Riedelsheimer. These materials combine in the installation designed by RPBW for the exhibition and make up an imaginary island where 100 projects created by Renzo Piano are collected.